You are currently browsing the The Pet Product Guru blog archives for July, 2013. Your pets liver is vital for metabolism and to get rid of toxic products. Did you know that up to ten percent of cats and dogs that go to the veterinarian have a liver problem. Dr. David Tweed, who is a veternarian at Colorado State University says that liver disease is not necessarily age related. There are some types of liver disease that can occur in older animals but liver disease can occur at any age. If you notice a yellow tint around your pets nose or eyes, take her to the veterinarian. Some other symptoms can include loss of appetite or vitality. It is always important to remember, never try to self diagnose your pet or administer any pet medication that is not prescribed by your vet. 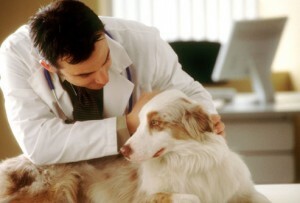 Your vet is the only person who knows what’s best for a sick pet. There are several ways that you can manage your dogs hip dysplasia. First you must keep your dog at the ideal body weight. This will minimize the stress on his joints. Sometimes, your vet will recommend non-steroidal and anti-inflammatory medicines to control pain and inflammation. He may also recommend a supplement for joints such as glucosamine and chondroitin. You should also consider physical rehabilitation for your dog. 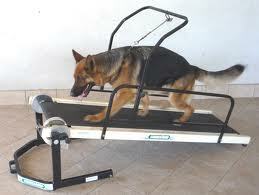 Try having your dog walk on a treadmill. It will help build and maintain body muscle. Sometimes a therapy laser is used for pain management. In some cases a total hip replacement is required. During your dogs exam, he will be measured for joint range of motion and thigh circumference. All dogs with hip dysplasia should be under a vets care. Great music on THE EDGEWATER INTERNET RADIO NETWORK. 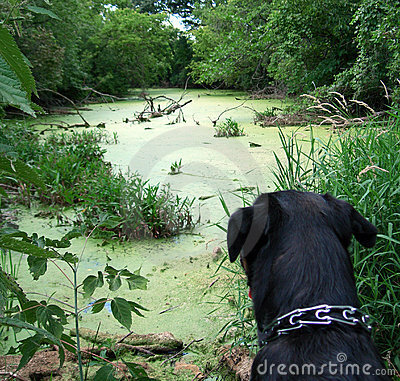 I just saw a report of a dog who died from drinking in a lake containing blue green algae. While the lake and its environs are well tended by the parks department, lakes do pose some threats to your dogs’ health that are worth considering before turning them loose for a quick dive into the water. If you notice that the water is greenish, don’t let your dog go near it at all. There’s a good chance that it may contain blue green algae. If you are walking in a wooded area and notice a pond, don’t let your dog near it. It may be stagnant and contain blue green algae. Always play it safe and stay away. Lakes also can contain pesticides, herbicides and other chemicals from drainage runoff, and these can irritate your dog’s skin and stomach. Again, you’ll want to be sure the lake is safe for swimming—for you as well as your Always make sure that the lake is clean and there is someone that you can check with regarding the condition of the water. Always make sure that your dog is allowed to swim in a lake. Usually there are signs posted letting you know if it’s against the rules. Be sure to bring a towel to dry off your pooch after swimming to avoid irritations and infections. Ears are an especially convenient breeding ground for bacteria, so make sure to dry them. THE NEW LINDBERGH MIX IS PLAYING RIGHT NOW ON LINDBERGH RADIO! THE BEST MIX OF THE 60’s 70’s 80’s and 90’s. You can find Lindbergh Radio on The Edgewater Internet Radio Network. Heart problems are life threatening and should be detected and treated immediately. There’s no time to spare ! 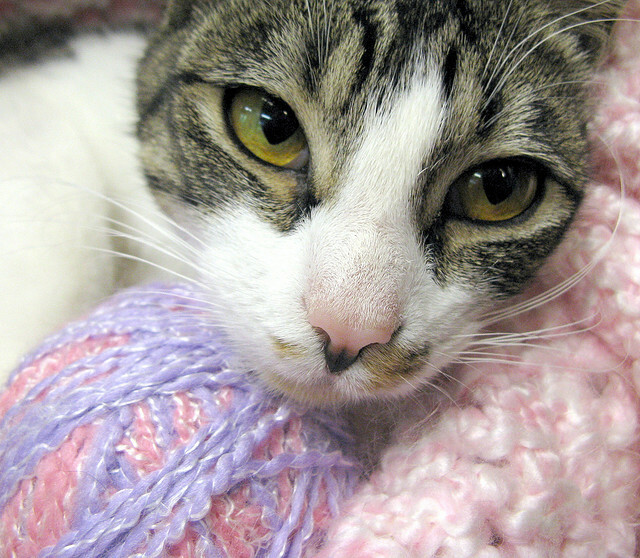 There are several clues to look for to determine if your pet has a heart problem. They seem to slow down and can’t play or exercise anymore. Dr. Andrew Lowell is a Veterinarian at the Pender Veterinary Clinic in Fairfax, Virginia . He says that pets and humans have common heart symptoms. If humans feel lethargic, tire frequently and can’t run anymore, this can be an indicator that there is a heart problem. 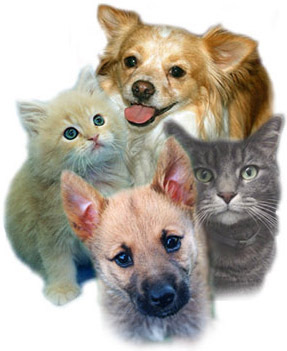 The bottom line is do not hesitate to call your vet as soon as you notice any change in your pets normal behavior. THE BEST MIX OF THE 60’s 70’s and 80’s DEBUTS TOMORROW AT 10:00am EST on LINDBERGH RADIO. IT”S FOUND ON THE EDGEWATER RADIO NETWORK! Our dogs love to come with us wherever we go. They especially love to go to the beach in the summer. There are some things that we must remember. First of all, dogs are not permitted on lots of beaches during the summer months. Before making a wasted trip, make sure you do your research and find out which beaches allow dogs during the summer. Here are some things that you should remember when taking your best friend to the beach this summer. Beaches can get very hot, make sure there is shade nearby where your dog can rest after romping through the sand and water. Check with your lifeguard for water conditions. Dogs are good targets for sea lice and jellyfish. Never let your dog drink sea water. It will make him sick. Salt and other minerals can damage your dogs coat. At the end of the day, make sure to rinse him off. Keep him away from other bathers. Make sure that you find a quiet, unoccupied area of the beach for him to run and play. If the beach is readily accessible to you, I would take him later in the day, around 5:30 – 6:30pm. It’s still light, there are less people on the beach, it’s cooler and the sun’s rays are not as strong. 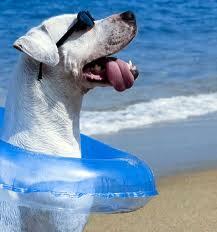 Have fun with your dog at the beach this summer and stay safe. Look the the best mix on the radio. We are revamping Lindbergh Radio’s format. Look for our relaunch with the best music from the 60’s 70’s 80’s and 90’s this Saturday, July 27th at 10:00 am. We’re your party station! You’ll find Lindbergh radio and five other great radio stations on THE EDGEWATER INTERNET RADIO NETWORK! Should You Feed Your Cat Table Food? Sometimes it’s hard to resist giving your beautiful cat some food from your dinner table. 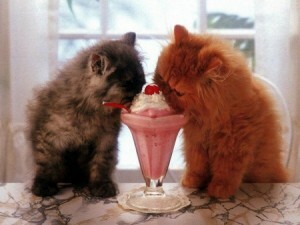 If you’re a wise cat owner, you will realize that many human foods are not safe for your cat. The reason for this is that humans have vastly different nutritional needs than cats. Even if your cat meows and begs for table food, it just may wreak havoc on your furry feline’s digestive system. Cats should never have onion, garlic, kelp, grapes or raisins, sugary treats, chocolate, and alcoholic or caffeinated drinks, even in small doses. If you speak with your vet, you’ll probably find that his list is a lot longer. The truth is, if you examine the fine print, some foods on these warning lists can be safe for your cat — but only in small doses but what is a safe dose? You’re better off avoiding giving your cat any table food. If you are convinced that your cat should have some table food, ask your vet to recommend the types of food and the amounts that will be safe for your cat to consume. A good, balanced cat food has all of the nutrients that your cat needs. You can give him a variety of food so he doesn’t get bored. I mix one cat of a high quality wet food with three types of high quality dry foods plus a few snacks in the evening. My cats seem perfectly happy and even look forward to their food and snacks. Great music and great internet radio stations on THE EDGEWATER INTERNET RADIO NETWORK! Click now, listen and enjoy! When do Cats Slow Down? I have two cats one is 14 years old and one is about 8. Mollie, my 14 year old has showed signs of slowing down. Although she’ still in very good health, she sleeps most of the time. She can still jump and run. She sometimes chases my younger cat out of the room because she wants all of the attention. So at what age can you expect your cat to slow down? Again, this depends on the cat. My younger cat, Millie, has showed some signs of slowing down but she is much more active than Mollie. Millie still likes to chase her stick toy and will dash throughout the house for exercise. I wouldn’t worry about it as look as your veterinarian has given your cat a clean bill of health. Here are some signs of slowing down. Not wanting to climb the cat condo as much? Any difficulty grooming the “hard to reach” areas? Difficulty going up or down the stairs, jumping up or down off of favorite perches, etc.? I would always get your senior cat checked for any potential problems. We all slow down! Don’t I know it! The best music is playing right now on THE EDGEWATER INTERNET RADIO NETWORK! Dogs need exercise but the extreme heat that we’re having in the northeast could be dangerous for them. Here are some things that you should remember. Take your dog out for light exercise in the early morning or late at night. These are the cooler parts of the day. Cut back on the exercise intensity this time of year. Use doggie boots. You could find these at the local pet store. They will protect your dogs feet on the hot pavement. Watch for signs of dehydration. An overheated dog will drool excessively. It will become lethargic, its eyes will be bloodshot, and it may appear a little pale. If you lift its skin, it will take longer than usual for the skin to fall back into place. Keep your dog hydrated. 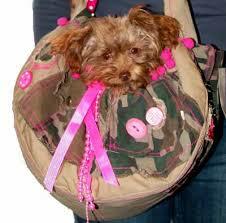 Carry a bottle of water when taking him for a walk. Stay in the shade if possible. Cool him off in a kiddie pool if you have one. You can also lay a wet towel down down for your dog lie on. 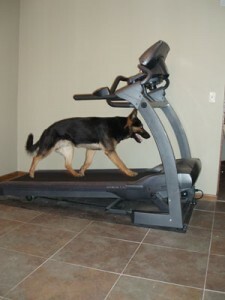 If you have a gym in your basement, you could always put him on the treadmill for a little run. NEVER leave your dog in a parked car in this excessive heat – not even for one minute! Great music is playing right now on THE EDGEWATER INTERNET RADIO NETWORK! 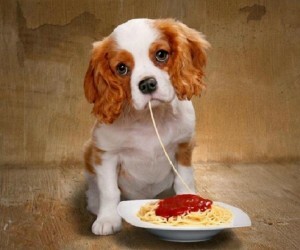 How much should a puppy and full grown dog eat per day? In the first eight weeks of life, a puppy should not be separated from it’s mother. Their mother’s milk provides them with the nutrition and antibodies they need to become healthy dogs. At three to four weeks, puppies should begin eating some solid food. You can try mixing three parts food with one part water or puppy replacement milk. This will make the food easier for the puppy to digest. If your puppy begins eating a little solid food before it leaves its mother, it will have an easier time adjusting when you bring it home. When your puppy is six to eight weeks old, feed him three to four times a day. Choose a puppy food that provides the appropriate balance of nutrients your puppy needs. Be sure it is getting the right amount of protein and calcium, and the proper amount of calories. Check the label to determine if you are feeding your puppy a balanced diet. A specified meat should be the first ingredient on the label. After eight weeks, feed your puppy twice a day. Puppies begin teething between three to six months. Make sure that he eats nutritious food twice per day. If he gets an upset stomach, take him to the vet. After six months, feed your dog a high quality food twice per day. Some of this information was provided by the Dog Breed Info Center. Spend your summer with THE EDGEWATER INTERNET RADIO NETWORK for a great selection of radio stations and music!